1. What is your favorite item from Bottega Vintage and how would you style it? 2. Your name & email. The giveaway is open to International readers and the deadline to enter is September 20th. Good luck! 1. 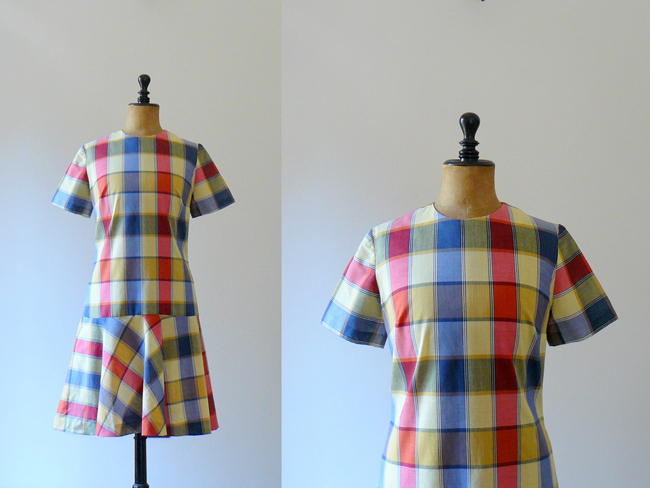 My favorite item in the store is the vintage 1960s mod plaid primary color dress. I love the different colors, especially the blue. So I would style it for fall with blue tights and dark brown boots, to keep the mod look but an updated version. I would add a long cold necklace. This dress is so perfect that you don't need to add to much to it. I love the 1960's green print dress. I would wear it with an orange necklace and of course, red boots. The Peach Dress (bridesmaid summer wedding dress) is a dream! 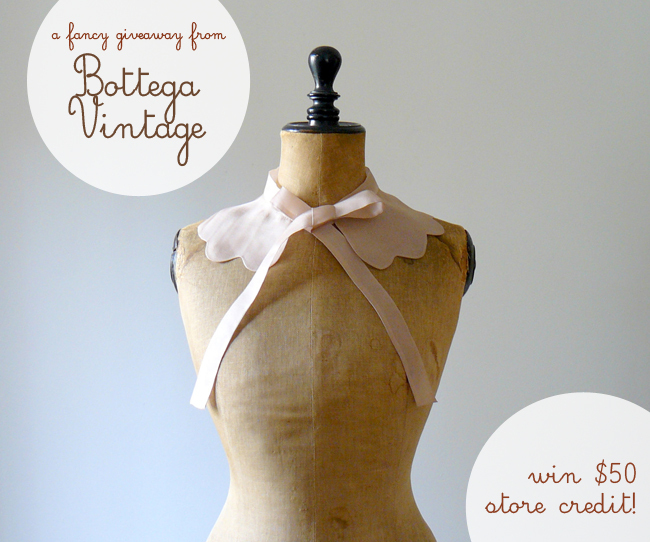 Thanks Bottega Vintage and Ashley for this sweet giveaway. So hard to pick but I'm going to go with the Vintage 1960s Mod Plaid-Primary Colors Dress!! My favorite item is the 1950´s baby blue white striped dress. I would style it with olive colored shoes (the spanish suede leather pumps from the shop) and an ocher coloured woolen vest for when it gets colder at night. my favorite item is the vintage 1970 summer strappy dress! It's so cute. I would love to wear it into the fall with a chunky grandpa cardigan and lace up ankle boots. 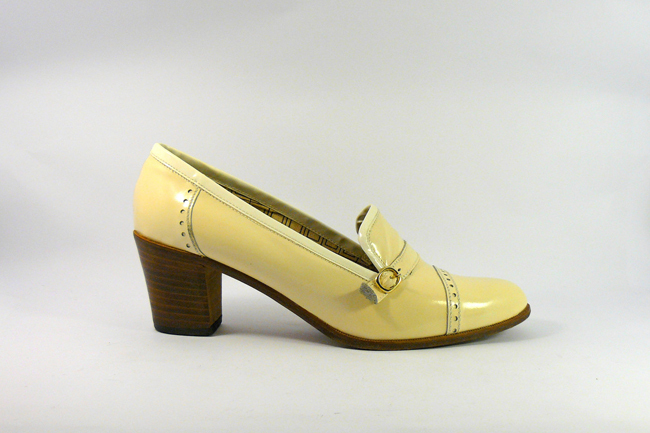 I would style it with flats or mary janes, a red hair barette and a wicker purse! 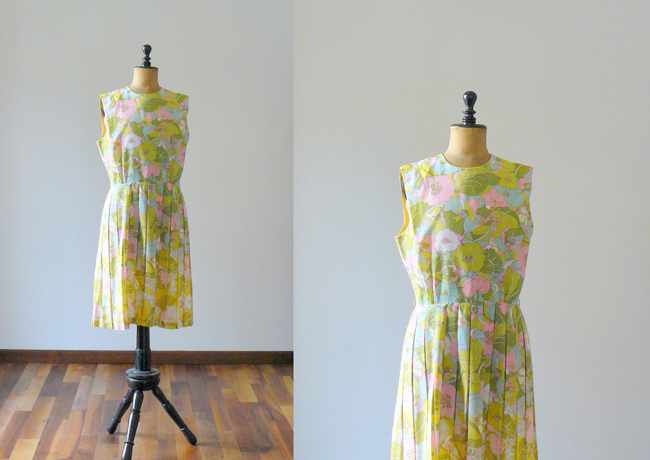 Or a picnic basket, this dress makes me want to frolic in the sun! http://www.etsy.com/listing/105867031/vintage-1950s-baby-blue-white-striped i'd wear it with white sandals and a white wicker bag and a biiig pair of cat-eye sunglasses. and a red headscarf! What a beautiful shop! Adding it to my favorites, & seriously eyeing that mod orange dress! They could easily be paired with jeans and a cute yellow cardigan. 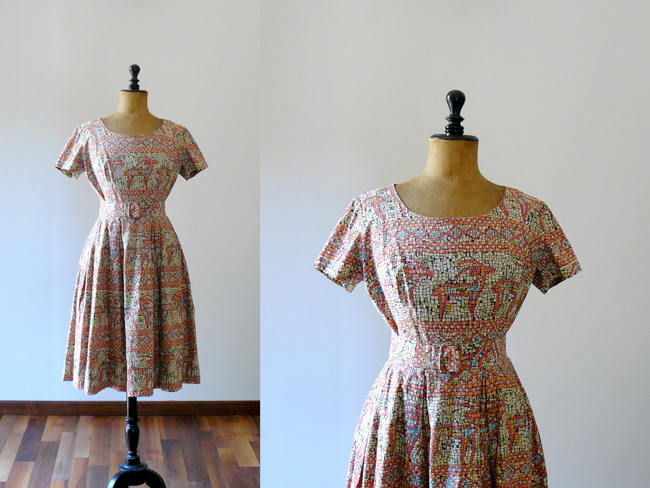 My absolute favourite piece is the 1950s micro mosiac deer print dress, styled with some plain wedge sandals and a wide brim sunhat it would be perfect for hot summer days! What a beautiful shop! Fun that you get to collaborate with them! Nice shop! ThanksIt's great to see there are some nice vintage selling italian shops on Etsy! So many pretty things... My fav has to be this beautiful coat.. I would wear it when chill starts coming out, over a dress, with boots, beret hat and with a polka dots umbrella on my hand, and then I'd never take it off! http://www.etsy.com/listing/93062543/vintage-1980s-slouchy-turquoise-necktie That blouse is fantastic! LOVE this shop, just fabulous, fabulous finds! 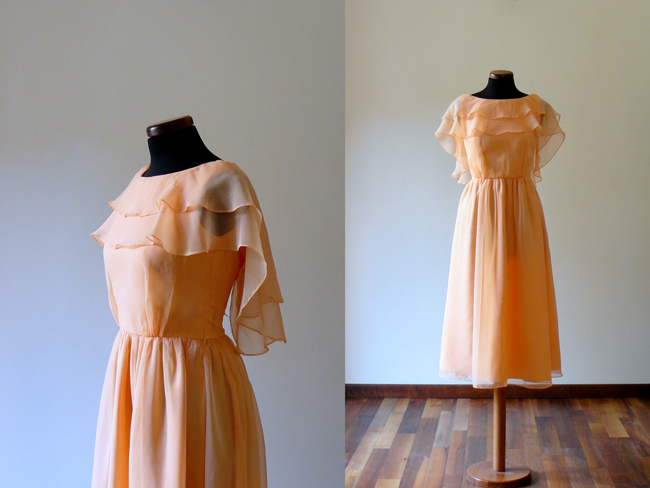 My favourite is that vintage peach dress above! (I'm a little/lot obsessed with peach right now...) I would style it with tan pumps, a skinny tan belt and a denim jacket. I'm in love with the shop and the vintage 1950s baby blue white striped dress! My favourite item is the vintage silk collar, so pretty and feminine. I would pair it with a sheer, white blouse with lace detailing and a pair of delicate, pearl embellished shorts to match. I'd add a pair of jewelled sandals and a swipe of pastel pink lipstick! I wish...! Such a lovely shop... found myself purring over so much, but I think this Vintage 1980s slouchy polka dot black blouse would be bang on trend, paired with some dark skinnies, a shoe boot and a devil-may-care attitude. one of my favorite items is the "Vintage 1980s pale pink and baby blue blouse". rose print shirt. I'd pair it with a dark grey pencil skirt. 1. My favorite item is the 1920s chiffon silk ivory piano shawl! 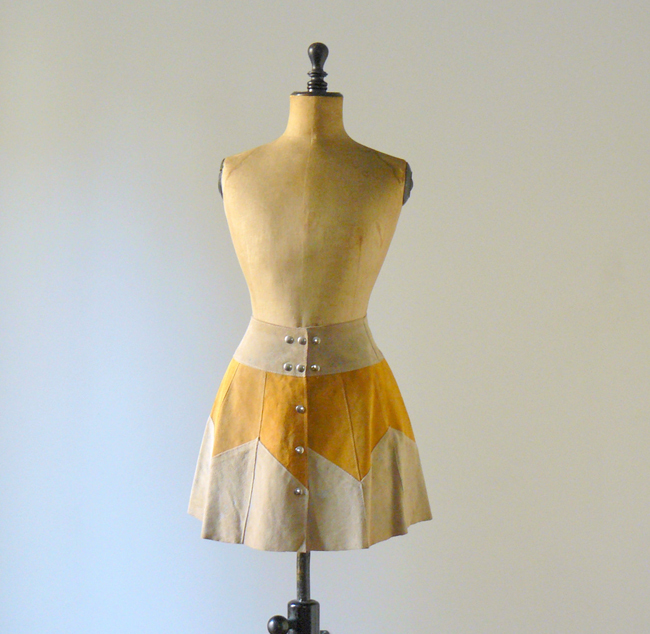 My favorite item is most certainly the brown leather mini skirt (http://www.etsy.com/listing/45112163/vintage-1970s-brown-suede-mini-skirt-a), I mean, that thing is incredible! I would wear it with a vintage oxblood turtleneck sweater, navy tights or knee socks, and gold loafers. I'm almost too busy oohing & awwing over the wonderful selection of things in the shop to pick a favorite. I'm smitten with the 70s azure dress; the lace bodice is gorgeous. I'd pair it with a pair of brown buckled boots, a delicate pendant necklace & a good book to read while wearing it. Thanks for the wonderful giveaway! I adore the 1960s Mod chunky plum beaded necklace and would wear it with a mod blue dress! I LOVE the Vintage 1970s light brown green tortoise shell frame sunglasses. Oversized butterfly eyewear. They would help all my non-cute pregnancy outfits look way cuter! I would wear it with my hair styled in a side bun (messy with a plait leading around my head), a straw hat with flowers and black Mary Janes! Of course, a pair of white lacy socks MUST be added! I love this 1950s dress with bows evrywhere! 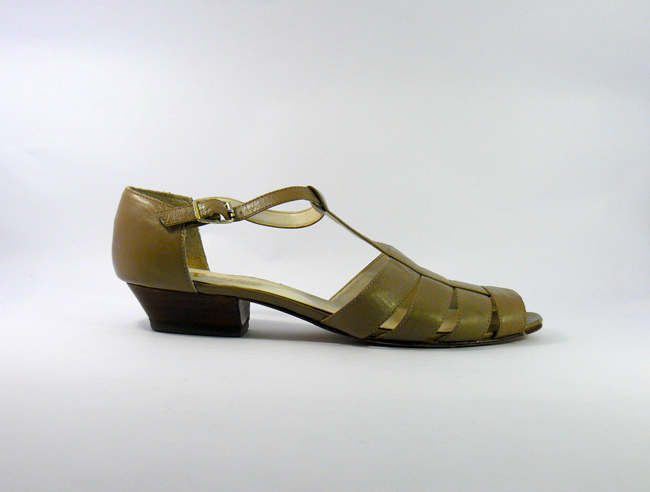 I would style it with a vintage wooly cardigan in orangey tones, and a pair of glittery flats! I would put up my hair in a ponytail, mess it up a bit and add.... a little orange bow! I would wear it either casually with skinny jeans or I could dress it up with a silk skirt. I would style it with some skinny jeans and brown booties. My favorite item from their shop is the Vintage 1940/50s black lace maxi dress with rose satin lining. evening gown! My favorite item in the shop is the Vintage 1940/50s black lace maxi dress with rose satin lining. evening gown. I'd wear one of my vintage cocktail hats and my Jeffrey Campbell cone heels.